How are you all doing? Hope great? Today's post is about a step I hope to take in the next couple of month. I found out about a place called PROJECT WALK a while back. 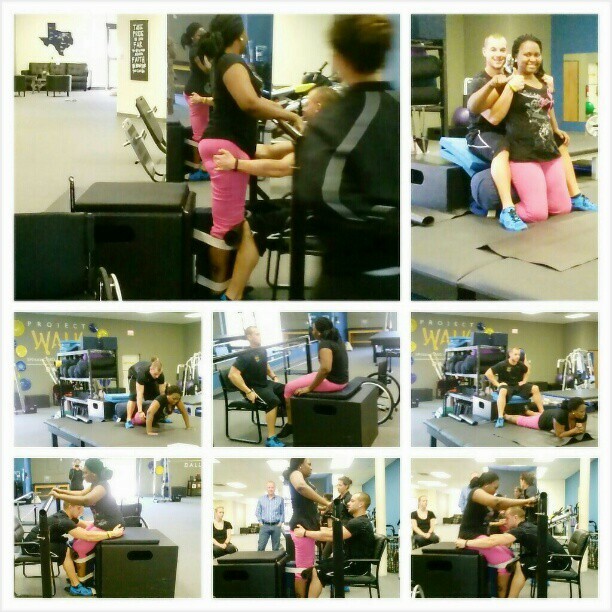 They help people with spinal cord injury to recover, be strong, and hopefully walk again. When I found out about them, they were in AUSTIN, TX, and that was kind of far away from me. Also when I found out, I was still in school and couldn't even pursue the opportunity because I wanted to finish my Nursing degree. Anyhoo, Fast forward to after graduation... I discovered that project walk now has a branch in Dallas, TX, which is a WHOLE lot more closer to me. I was happy and decided to go over there for a session. Here's a picture of me at project Walk. After my session there, I couldn't go back because of the out-of-pocket funding. They don't take insurance and require each person to pay out-of-pocket. When I posted the above picture on my facebook page and instagram as a way to tell my friends on there and inspire them that FAITH without WORKS is Nothing, I was amazed at the amount of people that sent me messages saying they were willing to donate to get me back to therapy. With this show of kindness from people and after months of waiting and thinking hard about therapy, I finally decided to start a Get Lizzy Back To Project Walk Fundraising page. My life since the car accident has been a long and interesting journey, But through it all, I have been able - by the grace of God - to maintain my faith that I will walk again. It has been a trying period in my life, but GOD has been faithful and helped me through so much. I Thank God for wonderful family members, friends, and well wishers all around me. As I stated before, I got my Bachelors of Science in Nursing degree despite being on the wheelchair, and I continue to push myself - Lol...ha. I just said PUSH - But... Anyhoo, I try not to place limitations on myself. I am a firm believer that with GOD, all things are possible. And this is one of the main reasons why I went to project Walk. I believe that I will walk again, but I also know that Faith without work is nothing. If you didn't click the previous link, Please CLICK HERE to be directed to the Fundraising page I started to get me back to Project Walk. My prayer is that, doing this, coupled with my faith as well as God's Mercies will Get me back on my feet and walking again. After I get the funds, I'll go to Project Walk, and Be sure to keep you all update through my blog. I'll greatly appreciate whatever amount you choose to donate. God Bless you and thanks for reading/Donating. I'm so glad that you are doing this! Although I can't help you financially, I've been job hunting since August with no luck, I will definiately keep you in my prayers. I've been following your other blog every since I started blogging. Your faith in God even after all that you've been through is just amazing and inspiring! I've been working on my relationship with God and this post just touched my heart. God always provides in due time. Thank you so much Crystal. I really appreciate your kind words. And Prayers are definitely welcomed. Also if you can share this project, I'll appreciate it. Thank you very much sir. I appreciate the prayers and I know God will answer us soon by HIS grace and mercy.